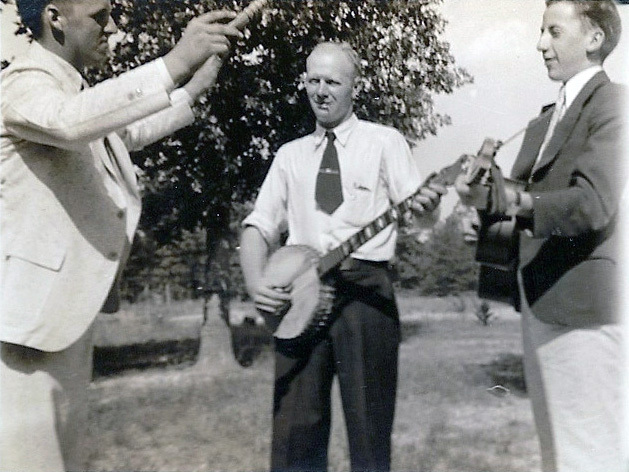 Buckingham County: Family Bands | slate river ramblings . . . .
Pictured above is a Winfrey family band, one of the many local groups that came and went in Buckingham County, playing at weddings, parties, and holiday gatherings. In April 2013, Slate River Ramblings reader, Kimberly Maher, commented on the post, Buckingham Notables: The Hamners, describing a band led by her maternal great-grandfather, Herman Springer. The Springer Family Band, featured Herman, his brothers, some of the younger Springers, and collateral relatives. The Springers worked primarily as farmers and carpenters. In 1910, they left Michigan and settled in Buckingham County. According to family tradition, Herman’s wife, Evie Shepherd, saw him playing with the band and decided to marry him. They were wed in a double ceremony with Jennie Springer and Ed Dunnavant, officiated by Rev. J. J. Spencer, on December 15, 1915. The Springer Family Band was mentioned in at least one episode of The Waltons, an affectionate nod from Earl Hamner to his youthful visits to Buckingham County. Who knows, perhaps the Springer Family Band played Nelson County, too. If there are musicians in your Buckingham family tree, please let us know. Bill, you are correct about the family connection. Herman Springer (Herman Jr. In our family’s parlance) was my grandmother’s younger brother. Herman (Sr) played the violin, as did his brother Arthur, later Evie played the guitar, son Jennings played the piano, and John and Ben Word (brothers) also played. My grandma played some piano with them a bit when she was a little tyke. Kimberly, It’s nice to know that Evie played the guitar, etc. Music clearly runs in the family! It’s a small Buckingham! Bill, did you ever hear about the band? No, I was not aware of the band. My father Thomas Archer Davidson “III” (born 1912; a grandson of Eli Banton Davidson’s brother Thomas Archer Davidson “I”) played clarinet and saxophone in several dance bands in his younger years, but I am not aware that my father ever played in the Buckingham area. Thomas Archer Davidson “I” left Buckingham in the late-1800s and he then lived in the Richmond, VA area (where I was born in 1947). It was not until I became interested in genealogy (in the last 10 years or so) that I actually learned much about my family’s involvement with Buckingham Co., VA. Thanks, Bill. I hope to identify more Buckingham musicians as time goes by. I would ASSUME that Herman Springer and Evie Shepard were the parents of the younger Herman Springer who married Grace Lena Davidson. Grace was a daughter of Walter F. Davidson and Hazel Melvin Farmer (the post mistress of Nuckols Post Office in Buckingham). Walter F. Davidson was a son of Eli Banton Davidson and Eli’s first wife Lucy Alice Nuckols. When she was younger, Hazel Melvin Farmer had been taken-in/adopted by Eli Banton Davidson, and she served as a maid at the old Davidson home named “Cherry Hill” (on Rt. 622). Herman and Grace Lena (Davidson) Springer lived across the street from “Cherry Hill,” and that home was occupied at that time by Grace’s sister Lucy Davidson (who had married Howard Mollohon). I once had lunch with the younger Herman Springer, and he died a few years ago. His wife Grace died back in 2005, and Herman moved to a different home, in a different part of Buckingham, after her death.